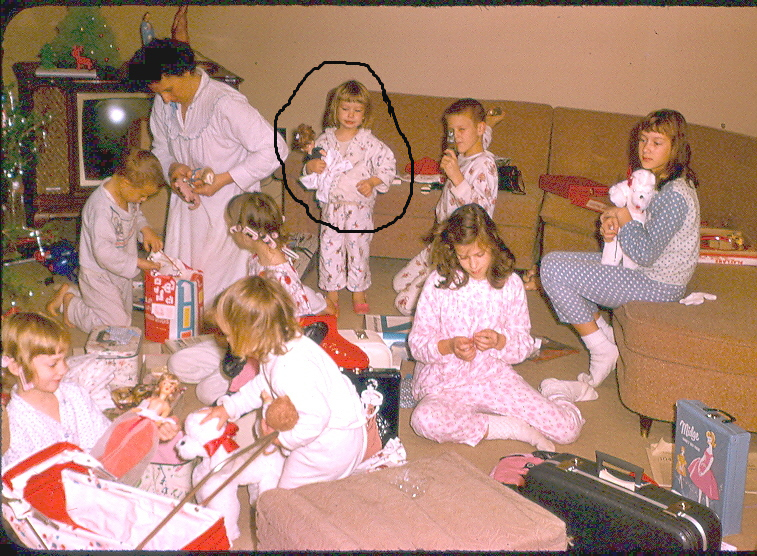 When did you open Christmas presents when you were growing up? Christmas Eve or Christmas Day? If you traveled, did your parents take the gifts, or did you open them early or late? Did your parents have Santa leave presents? Were they wrapped or unwrapped? Did you have stockings? What was generally in those? Were gifts simple and practical or more extravagant? Did you give presents to your parents and siblings? Were they homemade or purchased? If purchased, did you pay with your own money or did your parents pay? What are memories of special gifts you received? Did you ever peek and find out what your gifts were ahead of time? Did presents gradually appear under the tree in the days leading up to Christmas and were you allowed to touch/shake them? We always opened presents on Christmas Day. It seems like we always begged to open one on Christmas Eve, and were allowed to. Of course, that was before Santa came. We didn't have a fireplace in our house, so we put our stockings on the footpost of the bed or on the doorknob of the door to our room. In our stockings, we always had a tangerine and candy. If I'm remembering correctly, Santa wrapped out presents. One year, Santa thought it would be a good idea to put all of my presents in one big box, so I only had one big present to open. This is going to sound really bratty, but that was one of the most disappointing Christmases I've ever had. My parents did the best they could buying presents for all 10 of us. Most of our presents were practical; there were very few times we got anything that wasn't practical. Definitely nothing name brand. And, it seemed like every year, my sister & I would always get the same thing, but in a different color. She's 18 months older than I, so I know it had to have bothered her more than it did me. Since there were 10 kids, we would draw names. We spent many evenings staring at the presents and picking them up, shaking them to see if we could figure out what was in them. I'm sure we made things in school for our parents, but, honestly, I can't remember. I remember being overjoyed at getting a hula hoop one Christmas. When I was really little, we would draw names with cousins on my mom's side in Texas. Oh, the anticipation of waiting for the UPS man to deliver the packages! The anticipation is what made Christmas so special. We had to wait until everybody woke up to open presents. As the older ones got older, it was extremely hard to wait for them to get up, especially since us younger ones were usually up by 6:00. A couple of us would hand out the presents, then, daddy would count down and we would all open our presents. Talk about total and complete mayhem! Papers flying everywhere; it seems like every year someone would lose some little present and there would be tears. But, it would always be found, even if the mounds of wrapping paper were sifted through. As soon as the presents would open, daddy would insist that everything be taken to our rooms. Christmas at my house now seems really low-key, with only 3 kids. But, a lot of it's the same: the tearing into presents, and someone losing something. It wouldn't be Christmas without it! This is me during an early Christmas. I look to be about 3, maybe 4? Here's the funny thing: here's another picture of that same Christmas. Look what my sister that's 18 months older than me has in her hand! I visited your blog from the Friday Blog Hop. Loved your post, always fascinating to read about Christmas and how it's celebrated around the world. We always opened our presents on Christmas Day. We didn't have a stocking but we had a pillow case. My parents weren't very well off so we didn't have lots of expensive presents, but we always got the one thing we asked for, usually for me a modest "arty" present like SpiroFoil, or when I was younger, Barbie. Love the excitement on your face in the pic. I makes me want Christmas to hurry up and get here because i got my little girl who is almost two her first baby doll things and I can't wait to give them to her. LOVE! LOVE! LOVE! the photos!!! Love the curlers, too! Yes, we had the same "issue" of similar gifts. If one girl opened a gift and it was a sweater, nightgown, etc, then we all knew we would be getting one. So funny! Our UPS guy came last night. No joke. Everyone stopped eating to see what I got from my sister. They love the UPS man at this time of the year! Don't we all?! I wish I had remembered to ask how families opened their gifts - one at a time or all at once. I've followed you here on Friday Follows. 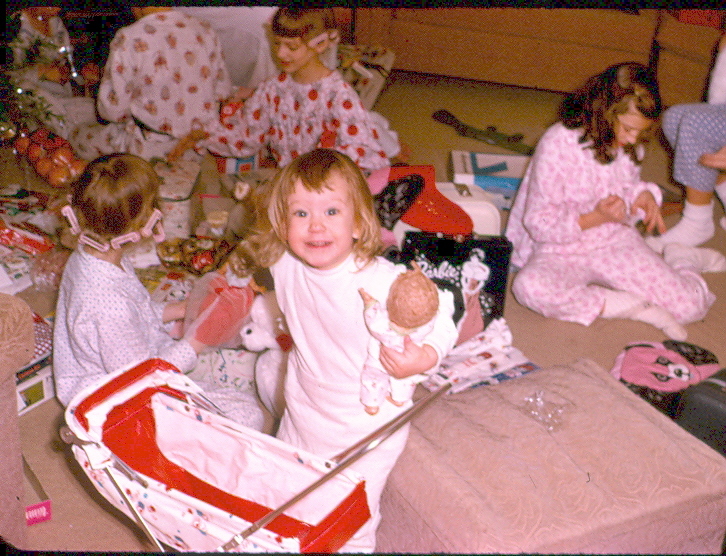 We always had to wait until Christmas Morning to open all the gifts! My best friend was German and they got to open their gifts Christmas eve. I thought this was unfair growing up! Drop by my blog and say hi! That's really funny. Your poor sister. But, in your parent's defense, it probably eliminated some arguing. I stopped over on the Blog hope and really enjoyed your posting. I was an only child so Christmas was really low key at our house. We opened gifts from each other on Christmas eve, then Santa would come and leave unwrapped gifts for Christmas Day and a stocking that usually had small toys that would probably pose a choking hazerd nowdays, chocolate coins and a candy cane or two that I am guessing was actually taken off the tree. Mostly, I remember getting to spend time with my grandmother, that was the best part because I didn't see her as much as I would have liked durring the rest of the year. Thanks for the walk down memory lane! I am now a new follower and will be back for sure. Wow, 10 kids opening gifts at once--that must've been something! We always drug it out and did one at a time. LOL Of course, with 10 kids, you'd have been there for two days, wouldn't you? That pretty little red/white doll carriage brings back fond memories! Hi, Sorry I can't stay long. I'm on a 40+ years and older hop. Trying to say howdy to everyone I can before my Dr. appointment. Hop back. Hook up your Hop. Enter my Giveaway. Need some people to enter. I'd enter myself but that would be weird. LOL Check out HWLWG. I'll stop again when I have more time. They did the same thing with me and our brother. We often got the same things. I have no idea if it bothered him. There were 8 of us and Christmas was always really low key. We got to open up our presents on Christmas eve, one at a time with either the youngest or oldest person going first and then on down the line. It was excruciatingly painful for us kids to watch our dad open his presents because he was very methodical and meticulous about it all, removing one piece of tape at a time without tearing the paper, folding it in half putting it in a little pile and then moving on to the next piece of tape. We got really good at wrapping presents with only three pieces of tape and when gift bags became popular, you could hear the angels shout Hallelujah! Wow, ten children! Your parents really had their hands full. Sounds like they did a great job. I would have been disappointed in the one big box too. My sister and I always had the same gifts in different colors too. Love the pictures from the past. WOW! As a parent, I can't even imagine having 10 children to buy presents for. Not only Christmas, but the rest of the holidays and birthdays too! You do seem to remember more than I do. And about your one present: It was because you were about to get your tonsils out (which, of course, you didn't). If it is any consolation, Mom said she shouldn't have done that when you were just sitting there watching everyone else still opening theirs. We always have the lost item, too, so that we have to go back sifting through the wrapping paper. I join the others who can't imagine TEN kids! Wow! I enjoyed your memories. My sister and I are fourteen months apart, and we got the "same gift, different color" thing too. For my part, I didn't mind--as long as my parents chose to give me the right color! Wow! That looks exactly like ME--That last photo. Pretty weird!